The most valuable member of the quartz family and birthstone for February. 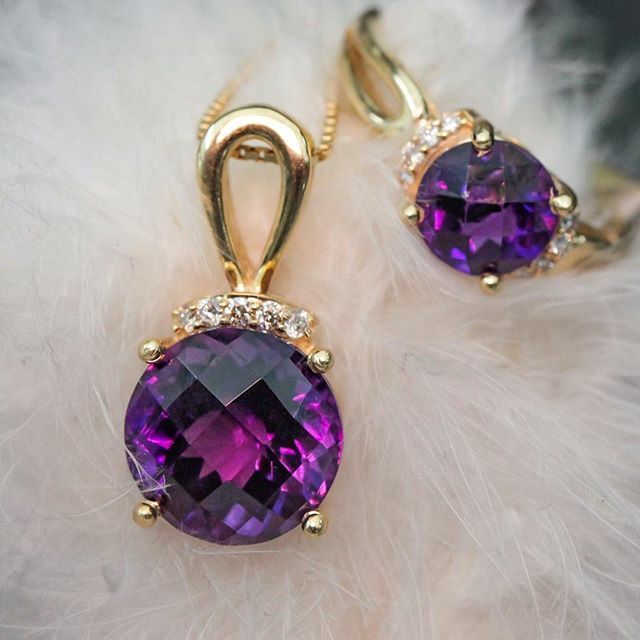 Amethyst gets its name from the Greek word meaning "not to intoxicate". Myth has it that the god Bacchus who, offended by the neglect of the goddess Diana, vowed vengeance by declaring that the first person he met would be devoured by tigers. The beautiful maiden, Amethyst, crossed his path, and as the beasts sprang toward her, she called upon Diana for protection. Diana saved her by turning her into a pure, clear stone. Bacchus became repentant and atoned by pouring wine over the stone, imparting it with a lovely purple hue. Because of this connection with Bacchus, the god of wine, it was believed that wine drunk from an amethyst cup would prevent the drinker from losing his wits. Most Amethyst is mined in Brazil, while Siberia, Uruguay and Canada also mine the gem. Since Amethyst is a relatively hard gem, it requires no special care.